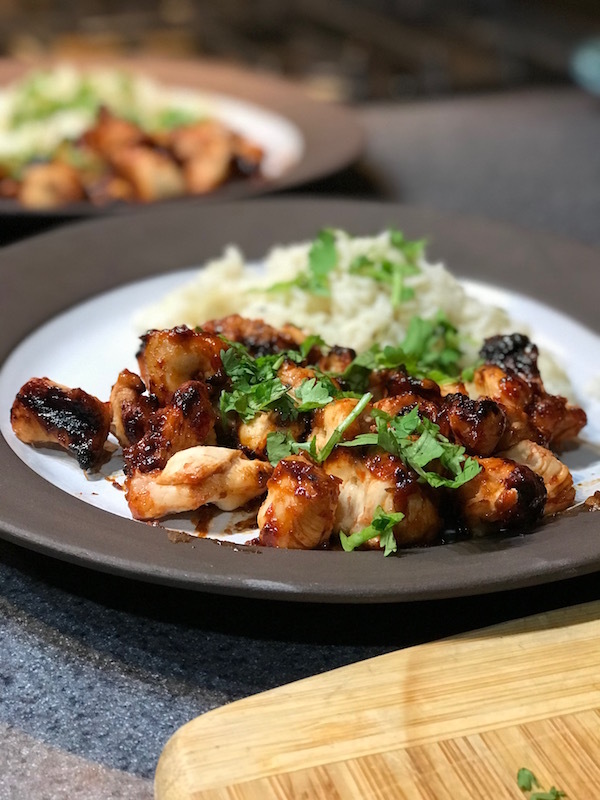 Spicy Chicken Skewers – Damn Life is Good! Sometimes you just want something spicy and full of bold, assertive flavors. This “chicken on a stick” recipe is simple, fun and oh-so-flavorful! Whisk brown sugar, vinegar, chili paste, fish sauce, Sriracha, and ginger in a large bowl. Add chicken and toss to coat and let marinate at room temp for 15 or so minutes. Thread chicken pieces onto grilling skewers (we use the bamboo ones and soak in water for 15 minutes first). Pour marinade to a small saucepan. Bring to a boil, reduce heat, and simmer until reduced by half and you’ve got about a cup left. Get your grill going on medium-high heat and grill the skewers, basting often with the reduced marinade, flipping and basting several times. You’ll get a nice sticky caramelization on the chicken. We’ll serve this with regular rice or rice pilaf – it’s spicy, sweet, sticky and delicious!